Home Our Attic Services Attic Cleaning Why Get Your Attic Cleaned/Decontaminated? What Does Cleaning And Decontamination Mean? You may not even know for sure what a cleaning or decontamination of your attic would entail to begin with, and certainly not why you might consider it. An attic cleaning means that professionals go into your attic and clear out all dust, dirt, debris, and other contaminants. They do so safely, so that there's no cross-contamination of substances getting into the air of your household for your family to breathe in. A decontamination takes it a step further, and a sterilizing spray is used to take care of any bacteria that may be lingering due to any kind of pests. So, why do either? It Helps Your Family Breathe More Easily! Even if nobody in your family frequents the attic all that often, the dust and other such things that are building over time can still affect the health of the household. Mold can begin to grow, especially if water gets in as well, and this can spread if not taken care of. When it pollutes the air and lowers the quality, everyone is affected. Those with breathing disorders are especially at risk for health troubles, and the elderly and children can also be harmed. Allergy sufferers will notice their symptoms worsening, and even those with no health issues in general will be fatigued. A Clean Attic Won't Attract Pests! 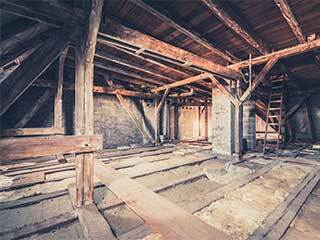 Another side effect of a dirty attic is that rodents or insects may be attracted to it. This can cause even worse troubles, as they can destroy insulation, wood, and belongings stored up there. They can also quickly begin to reproduce, meaning your problem will worsen rapidly before you know it. Creatures like these can spread diseases, particularly through waste or if they die and begin to rot, and cause more health hazards for your home. This is where decontamination comes in handy! Damaged Insulation Means Higher Energy Costs! If rodents have dug into your attic's insulation, or if water has degraded it, the effectiveness of it will be drastically lowered. Your home will then be unable to regulate the temperature as easily, and the heat and air conditioning will have to run more to try to keep up. It's best to keep your attic cleaned, and therefore your insulation safe, so your energy bill won't start to spike!